When those dark seasons of fear, anxiety and panic attacks hit, it can feel very hopeless. You pray, you beg, and you plead with God to take it away, but the fear continues to taunt and terrorize your soul. It can be very discouraging and very frustrating. And, very confusing. I want to share some encouraging words to help you through these dark seasons of fear that can be so crippling and disheartening. God has given up on me. I’m too much of a sinner. I’ll never be free from this. I’m just not strong enough. All of these are lies. Most likely, they are rooted in years of wrong thinking. The lies were unknowingly spoken over us by parents, family, friends and other influential people in our lives. While they may feel true in our lives, they are not! We can renew our minds and be changed (Romans 12:2). God is for us (Romans 8:31). We can overflow with hope (Romans 15:13). All of our sins are paid for and wiped away (Psalm 32:1). Who the Son sets free is free indeed (John 8:36). The Lord says, “I will guide you along the best pathway for your life. I will advise you and watch over you.” (Psalms 32:8). God desires to speak into your life through his tender, loving, divine whispers. Take some time to learn how to hear God’s voice. It may feel foreign to you, but God desires to speak to you. Jesus said, “My sheep hear my voice.” (John 10:27). The problem is that we often don’t take time to listen. Or, the busyness and distractions of the day make it difficult to be still and tune in our spirits to God’s Spirit. But, we must listen. “Faith comes by hearing,” (Romans 10:17) so we must take time to listen so that our faith can grow. When I look back at my life and think through all those years that I struggled with crippling anxiety, panic attacks and fear, it all came down to trust. I believed that I was in charge of my own life. I was responsible for my own peace, my own safety, my own future. The weight of my life was on me. I can tell you from experience that this is not a good way to live life. The more I learn to trust God and rest in his love for me, the more peace and rest I experience. The more I surrender control to him, the less I have to strive. I trust that all of my sins–past, present and future–are forgiven (1 John 1:9). I trust that my etermal destination is heaven (1 John 5:13). I trust that God will provide all my needs (Philippians 4:19). I trust that God will protect me and keep me safe (Psalm 91). I trust that he is always with me, even until the end of the age (Matthew 28:20). This week, I encourage you to stop believing the lies, let God speak to you and then trust him. Even when we are faithless, he is faithful (2 Timothy 2:13). Prayer: Father, help me break through this hopelessness. Speak to me heart and show me how much you love me. The day-to-day struggles of fear, anxiety and panic attacks can really take a toll on your soul. Things can feel so dark and discouraging. What can you do? 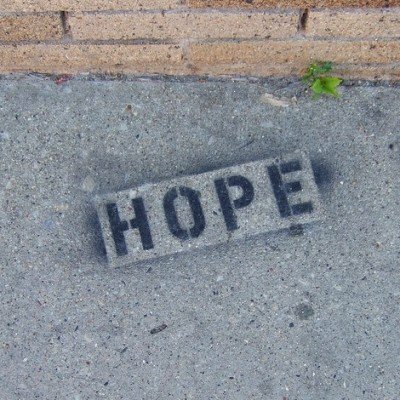 This week, I want to encourage everyone that there is hope. Hope is the one thing that gave me strength in the darkest of times. You need to know that there is hope in Christ. Let me share some promises with you that will encourage you and give you hope. God is faithful! He will complete the work he has started in you. “I am sure that God, who began the good work within you, will continue his work until it is finally finished on that day when Christ Jesus comes back again” (Philippians 1:6). May you overflow with hope through the power of the Holy Spirit. “I pray that God, who gives you hope, will keep you happy and full of peace as you believe in him. May you overflow with hope through the power of the Holy Spirit” (Romans 15:13). Strength and courage come to those who hope in God. “So be strong and take courage, all you who put your hope in the LORD!” (Psalms 31:24). God has great plans for you, and those plans include hope. When you lose hope, you can turn your thoughts towards God. “When I had lost all hope, I turned my thoughts once more to the LORD. And my earnest prayer went out to you in your holy Temple” (Jonah 2:7). There is great hope in the Lord! You can put your trust in him, and he will pour out incredible hope into your soul. Don’t try to figure everything out. Simply put your trust in God, and don’t lean on your own understanding (Proverbs 3:5). When you do, he will empower you and give you strength to stand against these attacks of the enemy. Be encouraged! God is on your side! Has your hope dwindled down to nothing? Have you completely given up on ever being free from this tormenting fear? Is there any light at the end of your tunnel? For years, my hope waned, dwindling down to almost nothing. Total despair and discouragement was quickly setting in. The anxiety and fear had so gripped my life that carrying out my normal daily routines was nearly impossible. But even in the despair, there was the smallest inkling of hope. I knew deep down in my heart that I was not created to live like this. Speaking prophetically of Jesus, Isaiah writes: “A bruised reed he will not break, and a smoldering ember he will not snuff out” (Isaiah 42:3). I knew Jesus would not abandon me nor snuff out what little ember of hope I had left. Let me share how Jesus can renew your hope and spark a new kind of faith in you. The synagogue’s daughter was deathly ill. Jairus frantically searched to find Jesus, because he knew that Jesus could heal his daughter and keep her from dying. He quickly found the Healer and pleaded with him to come to his house where he could pray for his 12-year old daughter. Jesus said, “Don’t be afraid. Just believe” (Luke 8:50). When those overwhelming thoughts would come crashing in and my mind would begin to race, it was almost as if I could hear Jesus speaking those words to me: “Russ, don’t be afraid. Just believe.” Yes, it is hard to stand still when your body is numb with fear and your mind is racing out of control. But God is with you. He will not leave you alone. “What is impossible with men is possible with God” (Luke 18:27). “Anything is possible to him who believes” (Mark 9:23). Prayer: Lord, I believe. I believe you are more than able to help me get free from fear. I know that your will is for me to live a life full of peace and rest. Lord, I put my trust in you.